M-Audio’s CTRL49 takes the Akai Advance control keyboard concept and adds DAW control. We’re used to seeing many similar music tech products competing within certain categories, but some lines are not just similar, they actually share the same components and code. The InMusic group seems to be taking inspiration from the automotive industry, where brands like VW, Skoda, and Audi produce competing models within well-defined product classes, while sharing many of the same parts from their parent company. 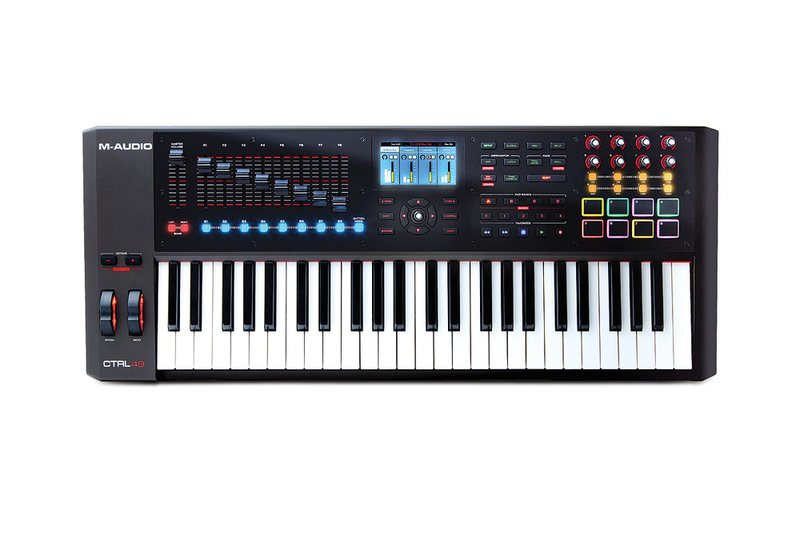 Now Akai Pro, M-Audio and Alesis each produce their own ‘Sub Compact’, ‘SUV’ and ‘Luxury Executive’ models of MIDI keyboard controllers that share technology from their various engineering and design teams. M-Audio’s CTRL49 is one of three ‘VIP Powered’ keyboards, the first of which was Akai’s Advance 49, which I reviewed a year or so ago. Alesis also have their own version: the VX49. There are notable differences between the three but they share the same concept: a keyboard controller that connects with a plug-in host, providing a global interface for all your VST instruments. All the keyboards use the same plug-in control centre, VIP, which works stand-alone or in the usual DAWs, and all three have the same colour-screen interface. Apart from the central screen, the CTRL49 is physically significantly different to the Advance 49. The Akai keyboard is very compact, despite its super-sized rotaries. The CTRL49 is quite a bit larger in both directions, and in fact weighs half as much again. The extra width is used by the pitch and mod wheels, which were above the keys on the Akai. On the CTRL49 these make way for a bank of nine generously sized faders. The extra depth on the front panel allows for a better in-line layout of the screen and its associated controls. The main control knobs and pads are smaller and laid out in two groups of four instead of a single row. The extra space allows many of the Shift layer functions from the Advance to move to dedicated buttons. The main control section is a nice glossy panel, although the body of the keyboard has a somewhat plasticky-feeling finish, which is also shared by the faders. We had the black version, but from what I’ve seen in photos the white-body edition looks much cooler. The semi-weighted keybed feels consistent with other higher-end M-Audio keyboards I’ve used like the Axiom Pro. The keyboard is very dynamic, requiring a good whack to get to maximum velocity, but the sensitivity is adjustable. Aftertouch tracking seems really accurate. The trigger pads are also very usable, and the knobs are smooth, without being overly weighted. Unless you like a wider, weighted keyboard, the CTRL49 would certainly double as a good general master keyboard controller. The CRTL49’s back panel features quarter-inch inputs for sustain and expression pedals, MIDI I/O ports, a USB port and a socket for the external PSU. While the installation and set-up of a hybrid hosting system like this could be tricky, M-Audio have made it as straightforward as possible. After registering the keyboard online you get access to the software downloads and your activation code. There’s also a video that takes you through the process step by step. VIP gets installed as a stand-alone app, along with AAX, AU and VST plug-in versions to run inside your DAW of choice. There’s a good bundle of instruments posted in your account, in particular AIR’s excellent Hybrid, Vacuum Pro, Loom and Xpand!2, plus Sonivox’s Eighty Eight piano. As a nice bonus, a look in VIP’s in-app content store reveals that AIR’s Transfusor and Velvet plug-ins are also included free, along with a couple of Hybrid expansion packs. VIP is the software side of the system and serves several roles. It hosts VST instrument plug-ins and maps their controls to the CTRL49’s banks of eight knobs and buttons. The majority of well-known plug-in instruments have been pre-mapped, giving you intelligent control assignments across multiple pages with no user setup required. VIP also give you the chance to edit assignments yourself, with the option to do this either for the plug-in as a whole, or for individual patches. VIP is also a central librarian that keeps track of all the patches from your instruments. An excellent multi-column tagging system lets you filter by various criteria. Again, this is successful due to a large amount of work having already gone into tagging patches. A simple download button in the plug-in manager page fetches and imports patches and maps for any plug-ins you add. Since our first review, VST effects have joined instruments in the list of plug-ins managed by VIP’s browser. To take advantage of this the AIR Creative FX collection has been added, which is a solid suite of plug-in effects that is part of the standard Pro Tools package. For the full rundown of new features in VIP 2.0, see the box below. 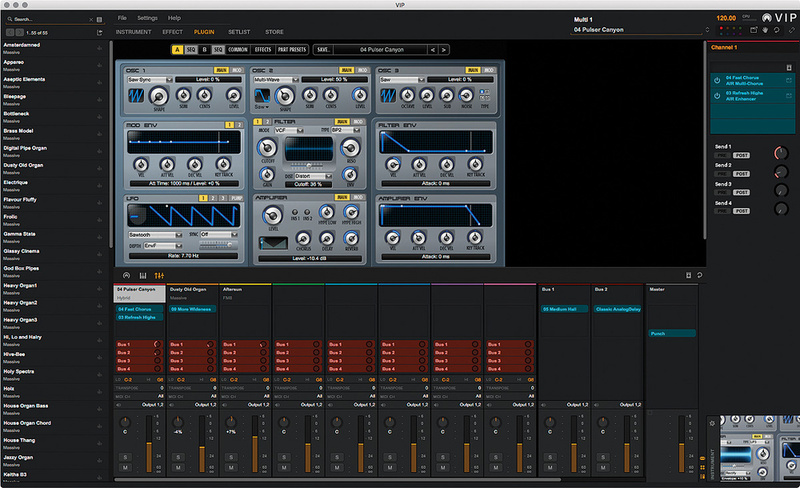 VIP is now a flexible host with insert and bus effects. The fader section extends the CTRL49’s control to your DAW as well as plug-ins. Integration is via Mackie Control/HUI across the board: there’s no dedicated Logic Pro or Live profiles. Given the simple scope of control this was perfectly adequate in the apps I tried (Pro Tools, Logic and Live). It even worked well in Reason, which has good Mackie Control across its devices... although, of course, you can’t run VIP there! As well as the faders, you have eight buttons that step through Mute, Solo, Arm and Track Select modes. Bank buttons let you navigate larger projects. Unfortunately, the faders are purely for DAW control: you can’t use them when running VIP in stand-alone mode, which is a shame as they’d be handy for mixing your Multis live. The simple addition of Track Select to the keyboard is really helpful, allowing you to target MIDI to different instances of VIP in your DAW. My grumble about the Advance has not been addressed here: although selecting tracks redirects MIDI from the keyboard, as you’d expect, the system is not smart enough to detect instances of VIP and sync up the screen and knob controls. This means you still have to manually select VIP instances on the keyboard, which takes a few button presses, or click a button in the plug-in window. This is a shame, especially as NI’s comparable Komplete Kontrol keyboards have solved this challenge in the major DAWs. Transport control is also provided as part of the Mackie Control connection, which worked as expected. Again, this was down to the excellent setup guides, which also include the steps for sync’ing up the keyboard and your DAW with MIDI clock. This sync keeps the onboard arpeggiator in time with your project. Like the Advance, the CTRL49 has an advantage over the NI keyboards in having arp functionality that’s not dependent on the software. On paper the CTRL49 and VIP are highly spec’d, but how do they stack up in real-world use? I thought the Advance had some usability issues in terms of layout and the onboard screen interface. I certainly prefer the CTRL49’s physical ergonomics, especially the way the knobs, buttons and pads share the same 2x4 layout as their representation on the screen. The screen is also centrally placed, and the selection buttons, data dial and page buttons have a better configuration. The extra dedicated mode buttons make things more intuitive. The weakest link is still the user interface employed by the screen. It’s not for lack of functionality: just about everything you can do in the VIP software you can also do and see directly from the keyboard via its screen. It’s just that the navigation system could be better: there are too many button presses required to achieve simple tasks. Sometimes you have to get to the right page, then click about with the cursor buttons to target the data wheel, by which time it’d have been quicker to go for the mouse. If you’re in Control view (where you can see what the knobs are doing) there’s still no way to change patch without switching to the Main view, targeting the patch list and using the scroll wheel. A Prev/Next patch shortcut would really help. To be fair, when you’re in one particular mode of working, or flipping between a couple of modes where the knob has previously been targeted, it can be OK. And the CTRL49 also adds a set of buttons that select the first five patches of a Setlist, which helps in live situations. Other than this gripe, the CTRL49/VIP combo does a great job of aggregating your VSTis into a ‘real’ playable workstation. VIP’s extensive capabilities for hosting multiple plug-ins has a wealth of uses and makes the CTRL49 much more than a controller. Making split and layered patches is simple for starters, and the new custom control mode means you can combine settings from several VSTis in a bank. In a studio context it can be really handy to set up template Multis in VIP that give you a range of instruments to start working with. In a DAW these can be routed out to multiple busses. There’s an obvious live application for the VIP-powered keyboards, not only because of VIP’s extensive internal mixing features. Different instruments in a Multi can be muted from the pads, and there’s an option where muting also shuts down the plug-in to save CPU resources. What I like even better is that you can set VIP to cache up to 32 recently used plug-ins in memory, so they are ready to go instantly when recalled. You can also choose whether a Multi stores a snapshot of all the parameter values of its plug-ins. All this functionality is used in the elegant Setlist function where you can store Multis or individual plug-ins in slots in a list. The plug-in caching means slots can be recalled that are ready to go, but without cutting off the decays of previous notes. The premium end of M-Audio’s keyboards are always a safe bet as both studio and live controllers. The CTRL49 has the added benefit of VIP software integration, making it a hybrid VSTi workstation. Of the three VIP-powered keyboards from the InMusic stable this is the mid-priced option, and is the most studio-focused, with its Mackie Control-based fader section dedicated to DAW control. I prefer its control layout overall compared to the Akai Advance, although it’s significantly larger and heavier. VIP has developed nicely into an incredibly functional host and plug-in. The setup is refreshingly simple, management of plug-ins is slick and with almost no effort you get a tagged library of all your VST patches with pre-mapped control. Navigation of VIP from the hardware still has room for improvement though. The rival Komplete Kontrol keyboards from NI lack the onboard screen but the hardware integration is, in many ways, slicker. However, the combination of features you get with the CTRL49 is unique. As well as competing with each other, the VIP-powered keyboards overlap with Native Instruments’ Komplete Kontrol S-series keyboards. Price-wise these have become more competitive, and the 49-key version is not much more than the CTRL49, despite being a higher-quality build. However, that’s just for the keyboard, while the VIP bundle includes a serious collection of instruments. The Komplete Kontrol hardware control interface and DAW integration are slicker, but the host is nowhere near as powerful unless you combine with Maschine. As a stand-alone instrument or live solution for VSTis, Apple’s Mainstage is a powerful alternative, but of course doesn’t come with the out-of-the-box hardware integration of a VIP package. The VIP host plug-in at the heart of these keyboards has gained some significant features since we tested it alongside Akai’s Advance. In particular, the internal mixer has been upgraded with inserts, aux busses and a master effects bus. Effects plug-ins can now be managed by VIP, and can be added to tracks and busses either in the software or from the CTRL49’s screen. An extra layer of navigation has been added to the screen UI to allow targeting and control of effect from the knobs. Each track can have up to four inserts, and each ‘stack’ can be saved as a preset. It’s kind of a shame the VST effect functionality is limited to use within VIP (there’s no version of the VIP plug-in for use as a pure signal processor). Multi patch operation has had a further boost with the introduction of Custom Control mode. This provides a layer of macro knob banks where you assign a mixed set of parameters from different plug-ins as well as MIDI CCs. VIP 2 lets you tweak your knob and button assignments further by setting ranges, polarity, button modes, etc. The only thing you can’t do so far is assign a knob to multiple parameters, which could be handy. These are yet more features that make the VIP keyboards stand out as live VI controllers and, as I mentioned in my previous review, fill a hole that was left by NI’s Kore. VIP is a great host with all instrument tagging and mapping taken care of. Live and studio workstation-style operation. Navigation in the onboard screen is still too slow and complex. Fader functionality in VIP would be nice for stand-alone use. Multiple DAW instances must be relinked manually. M-Audio’s take on the VIP-powered keyboard is the most studio-centric, with faders dedicated to DAW control. CTRL49 is a versatile control keyboard integrated with a stack of great instrument plug-ins.